NEW! Our NuMilano paper materials feature vibrant hues with a soft, supple texture. With its luxurious feel, this journal makes quite a statement as a long-lasting gift. 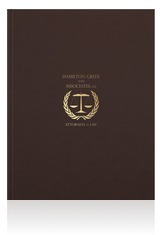 Features a 1-color foil stamp and perfect-bound spine.